Living for God’s Glory, by Joel Beeke (Orlando: Reformation Trust, 2008), 416 pgs. 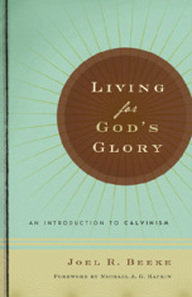 Living for God’s Glory is a very good and very unique book. It is a book on Calvinism, but it is unlike any book on Calvinism I have ever read. Instead of being primarily an exegetical or theological defense of the doctrines of grace, such as John Murray’s Redemption Accomplished and Applied or RC Sproul’s Chosen by God, respectively, Beeke’s volume is a series of reflections on the practical and devotional implications of Reformed theology. As such it is one of the most worship-prompting books I have ever read. The book is comprised of twenty-eight chapters, organized into six parts. While Beeke is the primary author (and editor), writing about eighty percent of the book, eight other individuals contribute chapters as well. The six parts are entitled “Calvinism in History,” “Calvinism in the Mind,” “Calvinism in the Heart,” “Calvinism in the Church,” “Calvinism in Practice,” and “Calvinism’s Goal.” These section headings should be clear enough to suggest what topics might be covered under each. With the exception of a couple chapters, I found every chapter interesting, informative, easy-to-read, devotional in tone, and generally very practical. In my limited experience, this is the book to give to those desiring to understand how a Reformed worldview influences every aspect of life. Read the rest of the interview here….